VYP-MSC Institute of Technology played host to an environmental group currently conducting the Manila to Tacloban Climate Walk – a peoples walk for climate justice. The group was composed of 11 “core walkers” but volunteers would be joining them in some parts of the walk. Supporting the group are members of Greenpeace, Aksyon Klima Pilipinas, Fast for the Climate and Climate Reality Project. The group has been spending nights in municipal gymnasiums and churches, and charges cell phone batteries and GPS trackers with their solar panels. In San Pablo City, the group spent Sunday evening at the green school campus of VYP-MSC IT and left early Monday, October 2. Headed by Nityalila Saulo, they held short programs and talks in communities along the way to raise awareness on the effects of climate change. Also in the group was Naderev “Yeb” Saño, the climate change commissioner, environmentalist, philosopher, nature lover, and peace activitist who painted dolphins on the gate of the green campus of MSC. 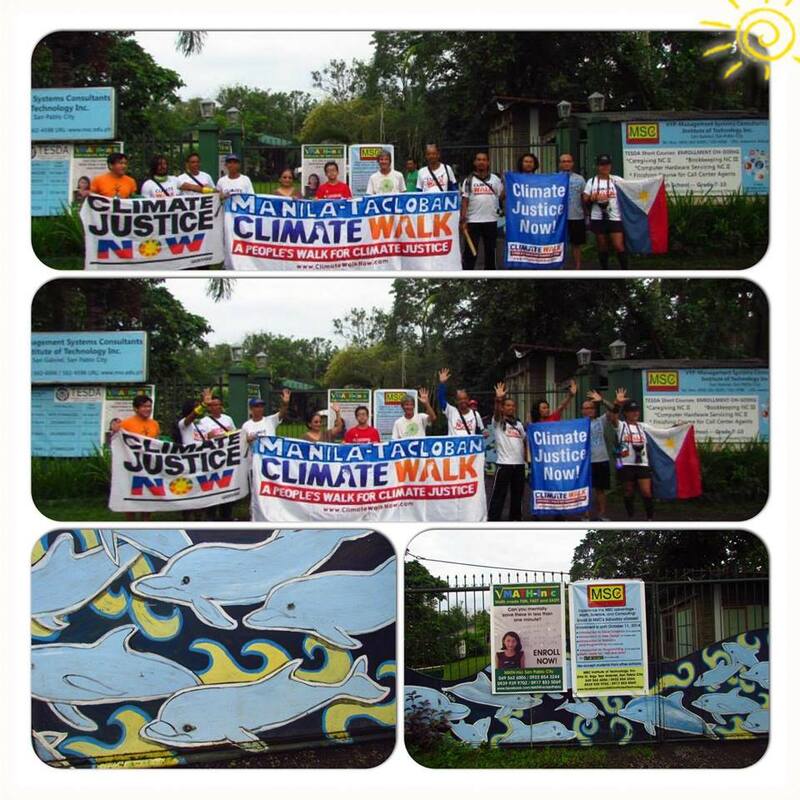 This entry was posted in MSC, MSC Green Campus, News, San Pablo City and tagged Aksyon Klima Pilipinas, Climate Reality Project, climate walk, Fast for the Climate, Greenpeace, Naderev “Yeb” Saño, Nityalila Saulo, Tacloban on November 18, 2014 by Jose Adonis Duma.